Golden Rules: Bronzer Do's & Dont's. Bronzers are a definite do during these summer months. 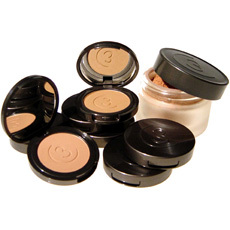 Whether you want to fake a glow or enhance one, they come in a variety of formulas and shades. Let me ask you this though. Do you know which formula or shade is right for you? And do you know how to correctly apply a bronzer? Well, Chad Hayduk, co-founder of Three Custom Color Specialists get asked those questions often. He is here to share with us his Do's and Dont's for creating a warm, sun kissed glow. Wearing the wrong shade of bronzer can look un-natural, un-flattering and sometime orangey. Three Custom Color has two shades of powder bronzer for either warm or cool skin. If you are unsure which one would work best for you, check out their handy warm vs. cool tool to help you select.